Winston Churchill ( 30 November 1874 – 24 January 1965) was an English statesman and author, best known as Prime Minister of the United Kingdom during the Second World War. Well-known as an orator, strategist, and politician, Churchill was one of the most important leaders in modern British and world history. He won the 1953 Nobel Prize in Literature for his many books on English and world history. Sir Winston Churchill was voted the greatest-ever Briton in the 2002 BBC poll the 100 Greatest Britons. His full name, including various titles conferred upon him by a variety of governments, is Sir Winston Leonard Spencer-Churchill KG OM CH TD FRS PC (Can). In 1895, he traveled to Cuba to observe the Spanish battles against Cuban guerrillas. Churchill obtained a commission to write about the conflict from the Daily Graphic newspaper. To Churchill's delight , he came under fire for the first time on his twenty-first birthday. In 1897, Churchill attempted to travel to the Greco-Turkish War, but this conflict effectively ended before he could arrive. He went on to England on leave before rushing back to India to help put down the Pathan revolt on the North West Frontier. On 12 October 1899, the war between Britain and the Afrikaners broke out in South Africa. Churchill went to South Africa as a war correspondent to cover second Anglo-Boer war in 1899. Caught in an ambush while riding a train, Churchill helped clear the track and get the train moving again with the wounded. Churchill himself, however, was captured and held in a POW camp in Pretoria. His actions during the ambush led to speculation that he would be awarded the Victoria Cross, Britain's highest award for gallantry in the face of the enemy, but this did not occur. 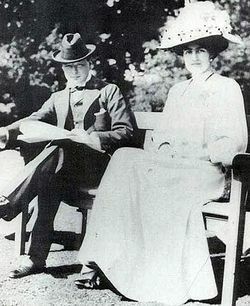 Churchill would later claim that he had been captured by General Louis Botha, subsequently prime minister of the then Union of South Africa, but this claim has been challenged, notably by Churchill's grand-daughter Celia Sandys in her book Churchill Wanted Dead or Alive. He was duly elected, but rather than attending the opening of Parliament, he embarked on a speaking tour throughout Britain and the United States, by means of which he raised ten thousand pounds for himself. ( Members of Parliament were unpaid in those days and Churchill was not rich by the standards of other MPs at that time.) While in the United States, one of his speeches was introduced by Mark Twain. He dined with Theodore Roosevelt, however, they did not talk to each other. In February 1901, Churchill arrived back in Britain to enter Parliament, and became associated with a group of Tory dissidents led by Lord Hugh Cecil and referred to as the Hughligans, a play on " Hooligans". 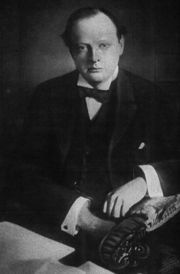 During his first parliamentary session, Churchill provoked controversy by opposing the government's army estimates, arguing against extravagant military expenditure. By 1903, he was drawing away from Lord Hugh's views. He also opposed the Liberal Unionist leader Joseph Chamberlain, whose party was in coalition with the Conservatives. Chamberlain proposed extensive tariff reforms intended to protect the economic preeminence of Britain behind tariff barriers. This earned Churchill the detestation of his own supporters — indeed, Conservative backbenchers staged a walkout once while he was speaking. His own constituency effectively deselected him, although he continued to sit for Oldham until the next general election. From 1903 until 1905, Churchill was also engaged in writing Lord Randolph Churchill, a two-volume biography of his father which came out in 1906 and was received as a masterpiece. However, filial devotion caused him to soften some of his father's less attractive aspects. In December 1916, Asquith resigned as Prime Minister and was replaced by David Lloyd George. The time was thought not yet right to risk the Conservatives' wrath by bringing Churchill back into government. However, in July 1917, Churchill was appointed Minister of Munitions. He was the main architect of the Ten Year Rule, but the major preoccupation of his tenure in the War Office was the Allied intervention in the Russian Civil War. Churchill was a staunch advocate of foreign intervention, declaring that Bolshevism must be "strangled in its cradle". He secured, from a divided and loosely organised Cabinet, intensification and prolongation of the British involvement beyond the wishes of any major group in Parliament or the nation — and in the face of the bitter hostility of Labour. In 1920, after the last British forces had been withdrawn, Churchill was instrumental in having arms sent to the Poles when they invaded Ukraine. He became Secretary of State for the Colonies in 1921 and was a signatory of the Anglo-Irish Treaty of 1921, which established the Irish Free State. Churchill always disliked Éamon de Valera, the Sinn Féin leader. Churchill, to protect British maritime interests engineered the Irish Free State agreement to include three Treaty Ports - Queenstown ( Cobh), Berehaven and Lough Swilly which could be used as Atlantic bases by the Royal Navy. Under cuts instituted by Churchill as Chancellor of the Exchequer and others, the bases were neglected. Under the terms of the Anglo-Irish Trade Agreement the bases were returned to the newly constituted Republic of Ireland in 1938. 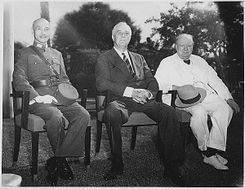 In this job, he proved to be one of the highest-profile ministers during the so-called " Phony War", when the only noticeable action was at sea. Churchill advocated the pre-emptive occupation of the neutral Norwegian iron-ore port of Narvik and the iron mines in Kiruna, Sweden, early in the War. However, Chamberlain and the rest of the War Cabinet disagreed, and the operation was delayed until the German invasion of Norway, which was successful despite British efforts. 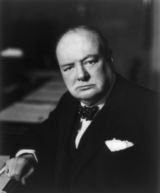 Although the importance of Churchill's role in World War II was undeniable, he had many enemies in his own country. His expressed contempt for a number of popular ideas, in particular public health care and better education for the majority of the population, produced much dissatisfaction amongst the population, particularly those who had fought in the war. Immediately following the close of the war in Europe, Churchill was heavily defeated in the 1945 election by Clement Attlee and the Labour Party. Some historians think that many British voters believed that the man who had led the nation so well in war was not the best man to lead it in peace. Others see the election result as a reaction not against Churchill personally, but against the Conservative Party's record in the 1930s under Baldwin and Chamberlain. Churchill was restless and bored as leader of the Conservative opposition in the immediate post-war years. After Labour's defeat in the General Election of 1951, Churchill again became Prime Minister. His third government — after the wartime national government and the brief caretaker government of 1945 — would last until his resignation in 1955. During this period, he renewed what he called the " special relationship" between Britain and the United States, and engaged himself in the formation of the post-war order. In Malaya, a rebellion against British rule had been in progress since 1948. Once again, Churchill's government inherited a crisis, and once again Churchill chose to use direct military action against those in rebellion while attempting to build an alliance with those who were not. He stepped up the implementation of a " hearts and minds" campaign and approved the creation of fortified villages, a tactic that would become a recurring part of Western military strategy in Southeast Asia. (See Vietnam War). As a painter he was prolific, with over 570 paintings and two sculptures, he received a Diploma from the Royal Academy, London. His paintings were catalogued after his death by historian David Coombs with the support of the Churchill family. Coombs has published two books on the subject. The modern archive of Churchill's art work is managed by designer, Tony Malone who oversees the administration and management of digital catalogue. Anthea Morton Saner and the Churchill Heritage Trust are responsible for all copyrights. Churchill's fondness for alcoholic beverages was well-documented. While in India and South Africa, he got in the habit of adding small amounts of whisky to the water he drank in order to prevent disease. He was quoted on the subject as saying that "by dint of careful application I learned to like it." He consumed alcoholic drinks on a near-daily basis for long periods in his life, and frequently imbibed before, after, and during mealtimes. He is not generally considered by historians to have been an alcoholic, however, since his drinking produced few, if any, noticeable negative effects on either his ability to govern or his personal life. The Churchill Centre states that Churchill made a bet with a man with the last name of Rothermere (possibly one of the Viscounts Rothermere) in 1936 that Churchill would be able to successfully abstain from drinking hard liquor for a year; Churchill apparently won the bet. According to William Manchester in The Last Lion, Churchill's favorite whisky was Johnnie Walker Red. As his coffin passed down the Thames on the Havengore, the cranes of London's docklands bowed in salute. The Royal Artillery fired a 19-gun salute (as head of government), and the RAF staged a fly-by of sixteen English Electric Lightning fighters. The state funeral was the largest gathering of dignitaries in Britain as representatives from over 100 countries attended, including French President Charles de Gaulle, Canadian Prime Minister Lester Pearson, Prime Minister of Rhodesia Ian Smith, other heads of state and government, and members of royalty. The cortege left London from Waterloo station, as Churchill had requested should he predecease De Gaulle. It also saw the largest assemblage of statesmen in the world until the funeral of Pope John Paul II in 2005. From 1941 to his death, he was the Lord Warden of the Cinque Ports, a ceremonial office. 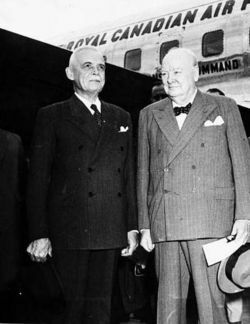 In 1941 Canadian Prime Minister William Lyon Mackenzie King swore him into the Queen's Privy Council for Canada. Although this allowed him to use the honorific title " The Honourable" and the post-nominal letters "P.C." both of these were trumped by his membership in the Imperial Privy Council which allowed him the use of The Right Honourable. "All great things are simple, and many can be expressed in single words: freedom, justice, honour, duty, mercy, hope." " We shall fight on the beaches, we shall fight on the landing grounds, we shall fight in the fields and in the streets, we shall fight in the hills; we shall never surrender."